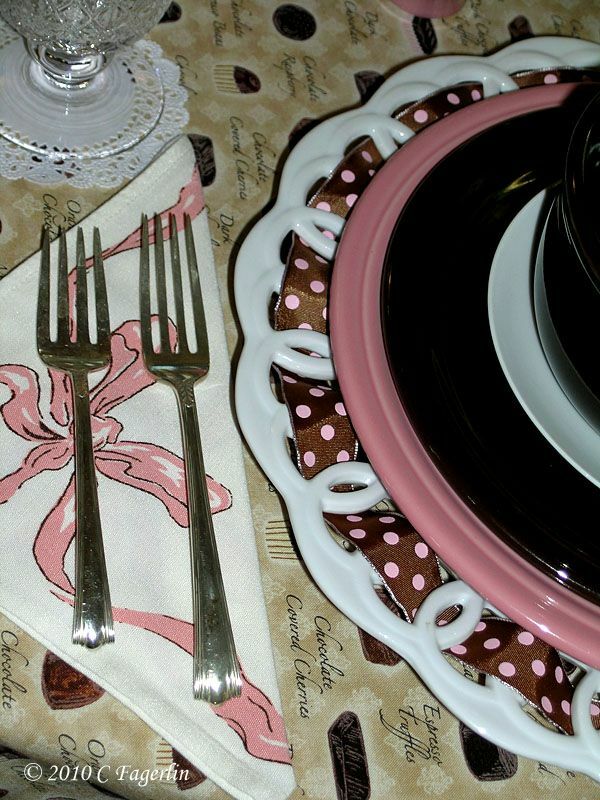 Welcome to Foodie Friday hosted by Michael Lee from Designs By Gollum. 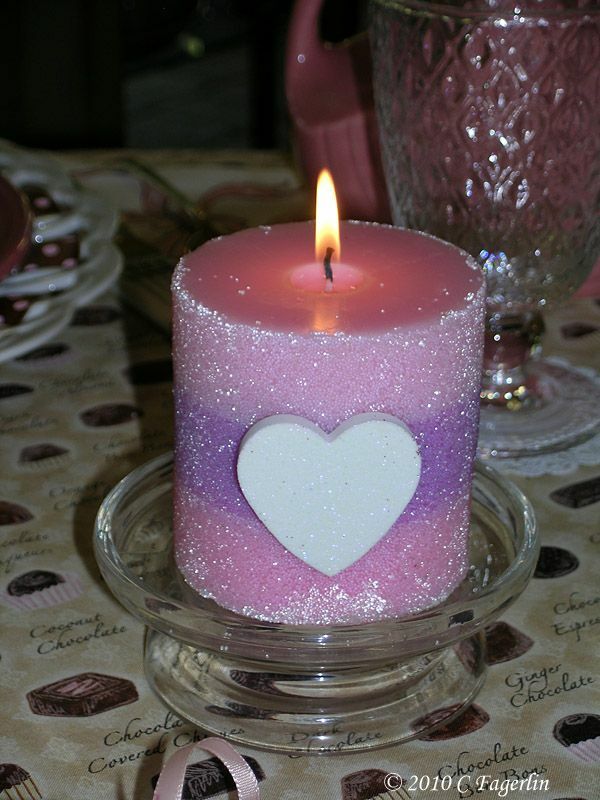 Be sure to stop by and check out her wonderful blog and all the participants' contributions. 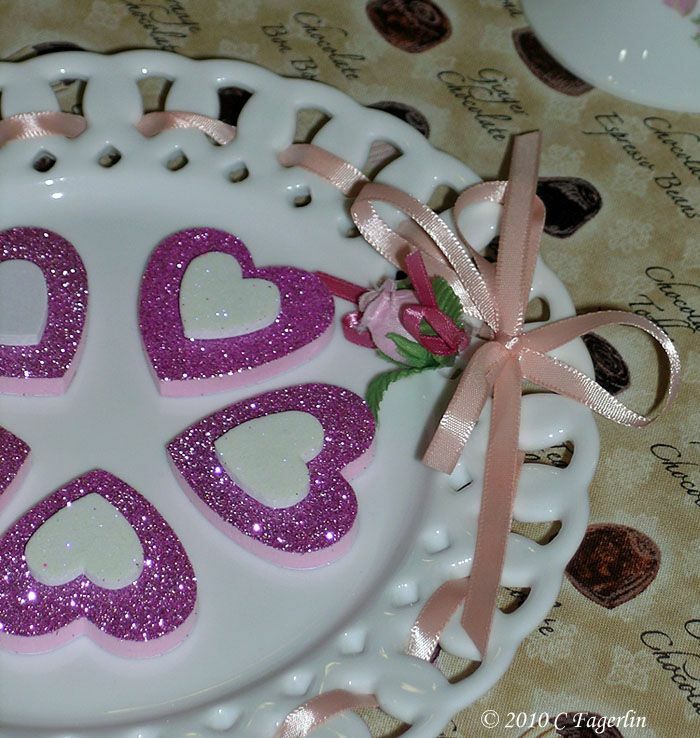 are traditionally offered for Valentine's Day and go straight to the chocolate for me! chargers are Made In China, as is the little ribboned plate in the center. 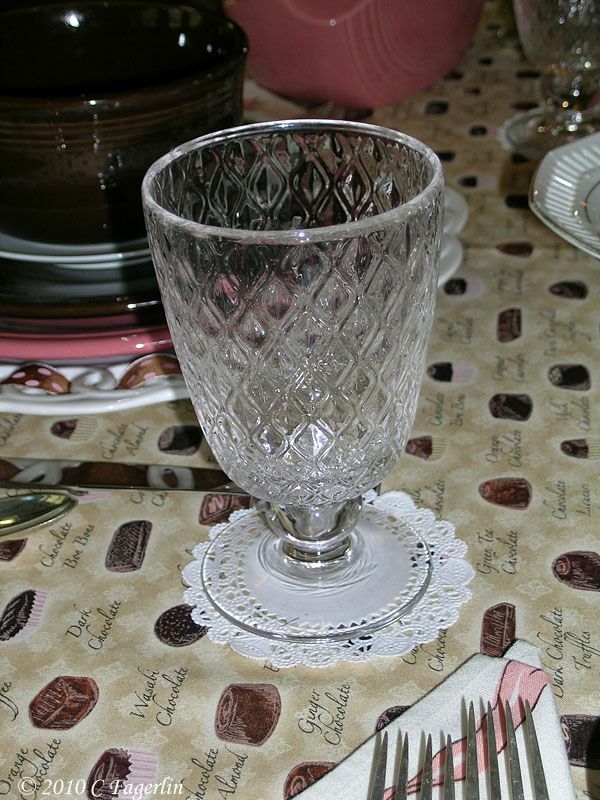 The little cutwork compote is German, the underplates for the Chocolate Fiesta bowls are Rosenthal. but it makes a huge batch, takes all day, makes a huge mess and Mr. TLRT isn't crazy about it. Instead here is a great twist on traditional Mexican Flan. Set out 10 small custard cups, and a roasting pan large enough to hold the cups in a water bath. Mix the sugar and water in a small saucepan, and bring the mixture to a boil over medium heat. Continue to cook, without stirring, until the syrup turns a deep amber color, about 8 minutes. Dvide the caramel among the custard cups, and tilt the cups to coat the bottom and sides. Set the custard cups in the roasting pan. Pour the half-and-half (or milk and cream mixture) and the milk into a large saucepan. Add the chocolate, cinnamon stick and sugar. Bring to a low simmer over medium heat, cover and set aside to steep for 20 minutes. In a large bowl, beat together the eggs, Kahlúa, vanilla and almond extracts. Slowly beat the hot milk mixture into this. Strain all the custard through a fine-mesh sieve and throw out the cinnamon stick. Pour the mixture into the caramelized custard cups. Place the roasting pan with the custard cups onto the center rack of the oven. Pour in enough hot tap water to reach halfway up the sides of the cups, and loosely cover the pan with foil. Bake just until the custards are set but still slightly wobbly in the center, usually 20 to 25 minutes. They will firm more when chilled, so do not overbake. Take the custards out of the water bath, cover them with plastic wrap, and refrigerate at least 2 hours. To unmold the flans, run the tip of a knife gently around the edge of each custard cup, then put a plate over the mold and flip over. Serve immediately. Flan and chocolate with Kahlua what a great combination!!!! I will definitely make this recipe. Lovely chocolately table too! I love your table! Pink and brown is a favorite combo of mine. Very nice table and the flan recipe looks heavenly. The flan sounds delicious and your table is very pretty! Oh, wow! That sounds like a divine dessert! 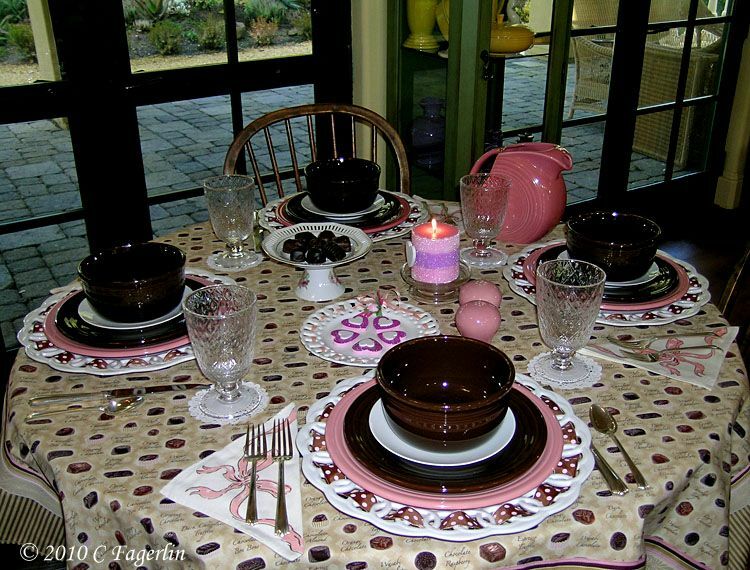 And such a great tablescape, too. Love it! 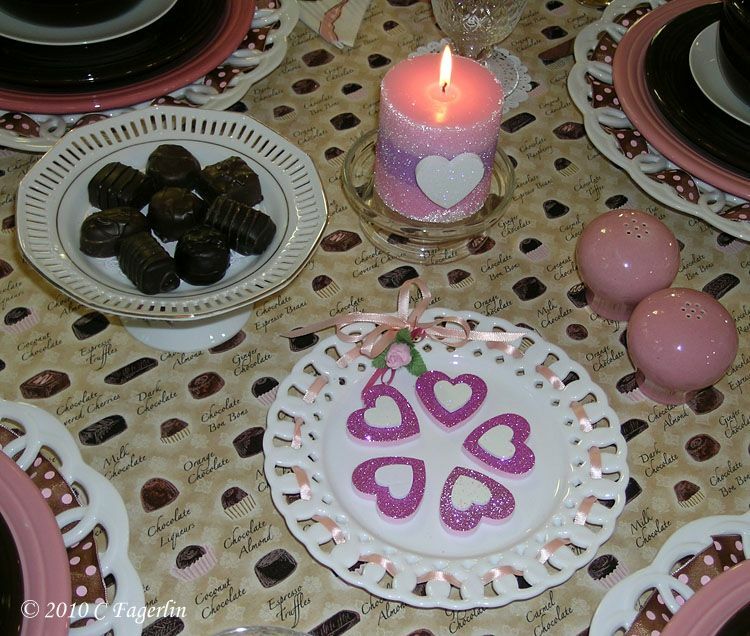 The flan recipe looks delicious, and so does the table setting. I've alway loved brown and pink together and you've done it so well. I love that tablecloth. Did you make It? I can almost smell all of that wonderful chocolate! I love chocolate, cinnamon and have a bottle of Kaluah. This one is a keeper! I'm having some beautiful chocolate with my breakfast! Yum! 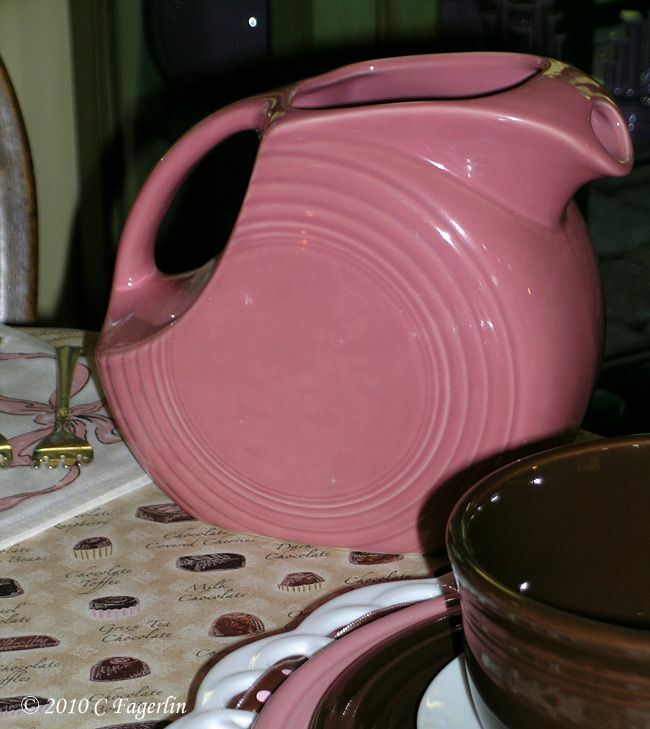 LOVE pink and brown and that flan WILL be made. Thank you! I LOVE CHOCOLATE!!!! 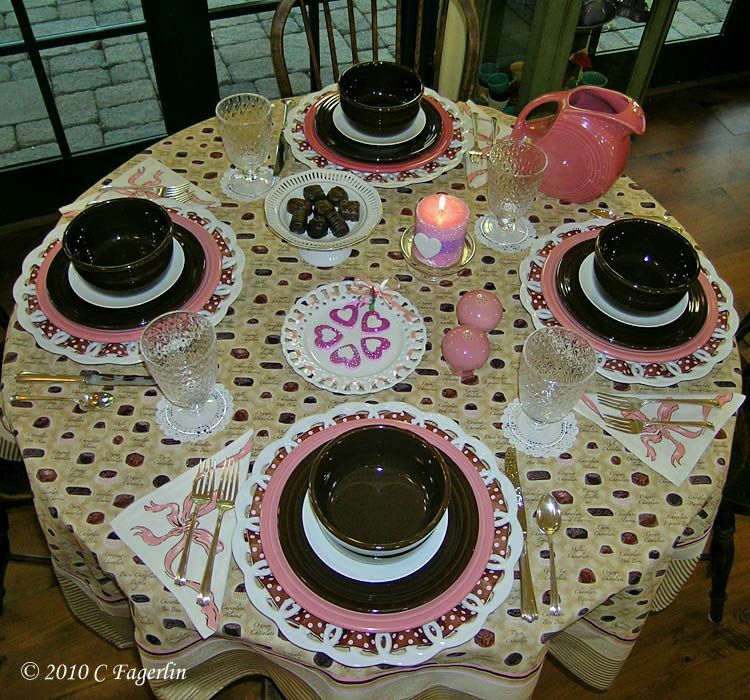 !You always have the most pulled together tablescapes!Beeeeautiful! Heck! 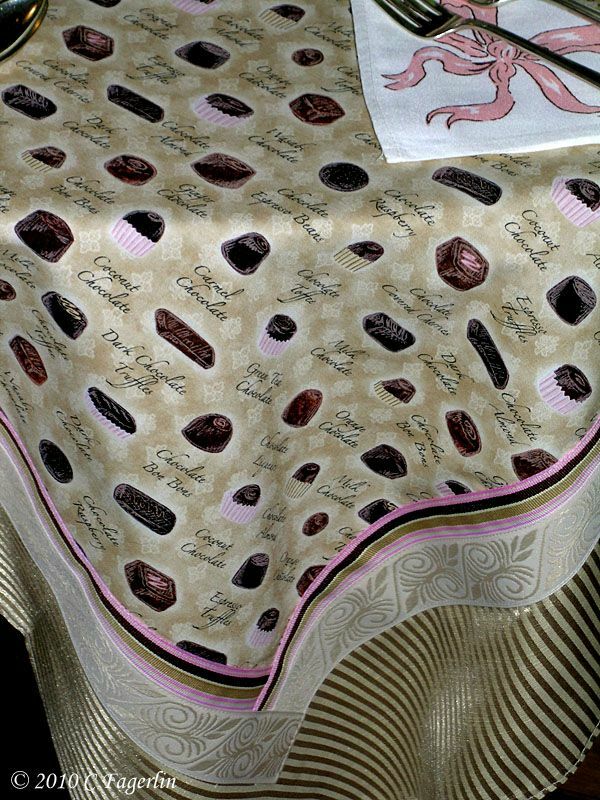 Just the tablecloth made me hungry!! Everything looks beautiful, as always! 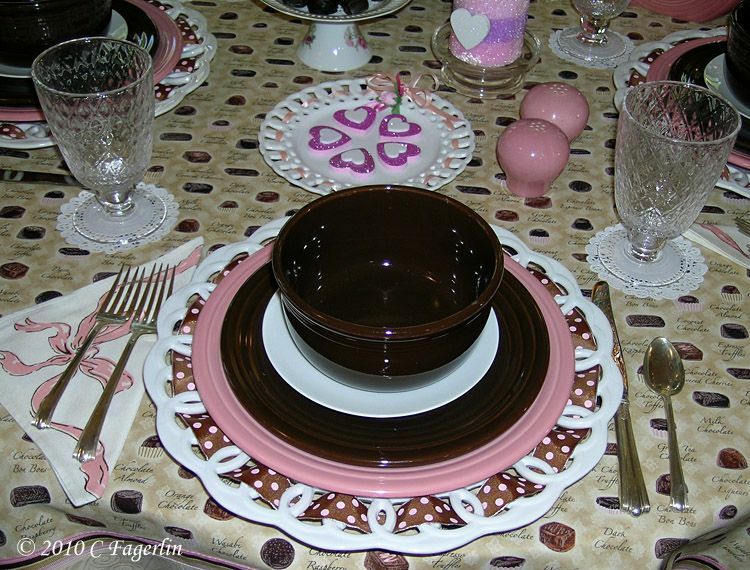 Pink and brown are such a yummy combination! You can't go wrong with chocolates. The flan recipe soumds great. 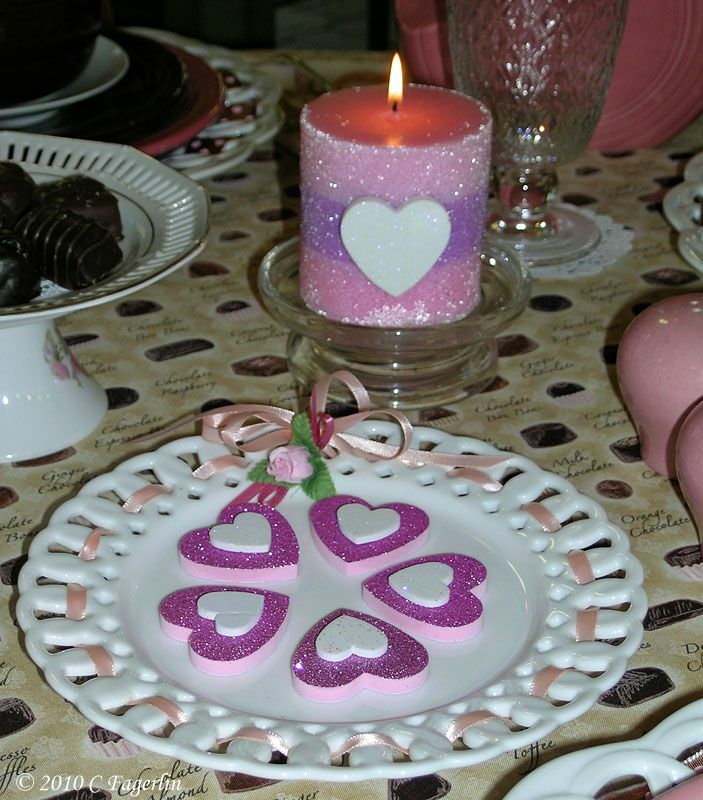 I love table setting. The chocolate flan is ..... divine! Yes, Honeysuckle I did make the table cloth, just had to have the chocolate theme thing! 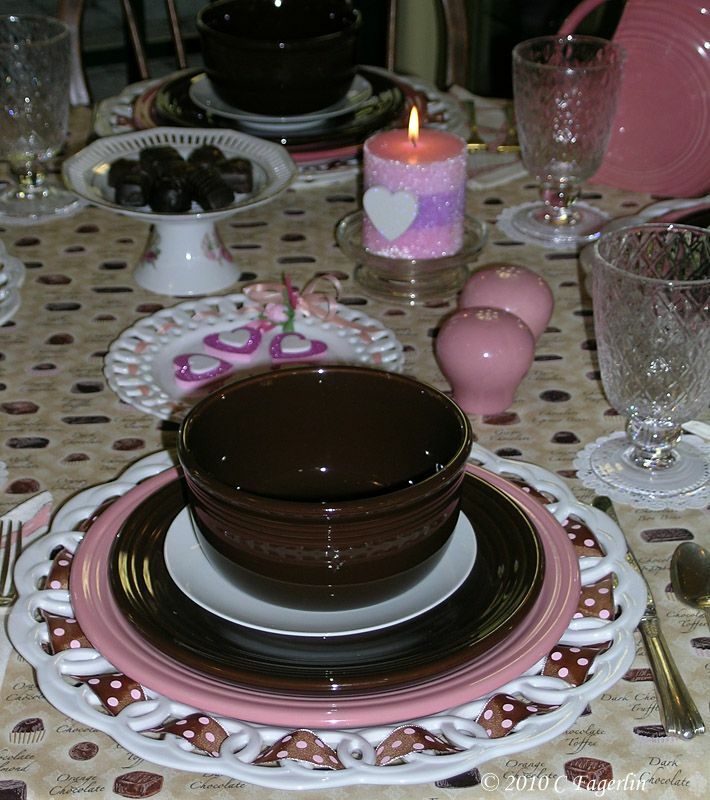 Thanks for stopping by, check back this Thurs & Fri for some additional V-Day tablescapes. Hope to see you all then. I love this, and I live in the Country of the Chocolats !!! Thanks Maria, I'm glad you enjoyed this no-calorie bit of goodness!